When King County Metro removed its buses from Seattle’s downtown transit tunnel last month, Metro also abandoned its part-time customer-service kiosk inside Westlake Station. The triangular, green-trimmed stand, which displays 52 feet of wall and window frontage, presents a redevelopment opportunity. A music stage could go there, or public restroom, visitor-information center, florist or hamburger shop. Maybe even a bodega, better known on the West Coast as a minimart. Those seem unlikely, however. Sound Transit intends to convert the empty stand into a security post, as the regional agency assumes ownership of the four-station downtown tunnel from Metro early next year. 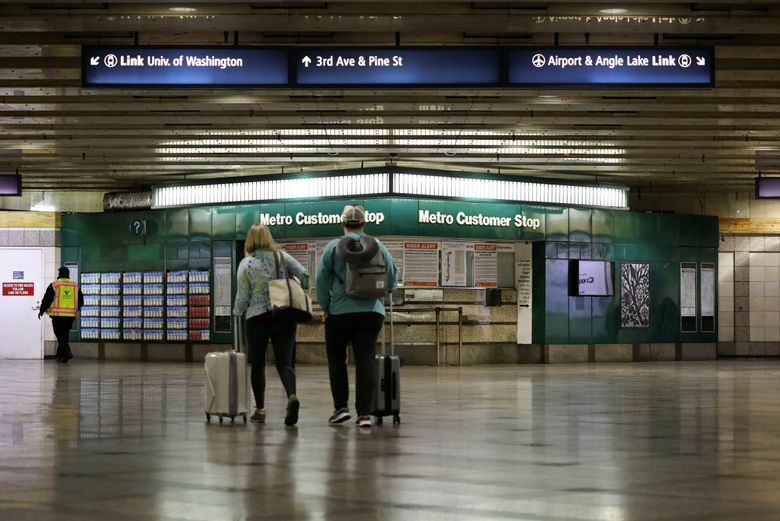 “The objective is to place security and lost-and-found at a central location, to ensure service to the increasing number of riders who will be using Westlake as a major hub on an expanding regional system,” said Sound Transit spokeswoman Kimberly Reason. About 24,000 people a day enter or exit trains inside the vast, two-block-long station. Ridership will grow when U District, Roosevelt and Northgate stations open in 2021. New signs and lights are to be installed. A security stand can proceed without a vote by the transit board, because it entails virtually no cost, Reason said. Train-station stores are common in Europe and Asia. New York City’s grimy Penn Station is full of nooks to grab a sandwich or magazine before jostling downstairs. Washington, D.C., last year opened a transit swag store at Metro Center Station. Some SkyTrain stations in Vancouver, B.C., contain underused retail space, that will be rewired and replumbed for eateries or Asian-style markets, where riders could someday pay using fare cards, CTV reports. Philadelphia and New Jersey stations host farmers markets, says the American Public Transportation Association. That’s a likely use for future Sound Transit station plazas. Helen Schilders, walking toward the Third Avenue station exit last week, said, “I’d like to see some musicians performing here. I would like to see a performance space, or theater.” Schilders, who is Dutch, said she moved here during its 1990s grunge era, and artists since then have been displaced from city neighborhoods. Others praised the security proposal, to keep Westlake Station a refuge from the chaos overhead at Third and Pine Street. Three friends mentioned a man they passed Tuesday shooting drugs on a southwest staircase, where afterward a syringe and broken glass appeared. Sound Transit is adding $9.5 million to increase private Securitas guards and King County sheriff’s deputies systemwide this year, the budget says. Restrooms aren’t planned, though the transit board this year will consider how to assure public toilets in future stations. The only restroom on the light-rail line now is 34 minutes away at SeaTac/Airport Station. Citizens often implore Seattle’s government to solve a citywide lack of public restrooms, though a steel Portland Loo is proposed for Ballard this year. Amy Pham, of Tacoma, wished for a family lounge to rest a few moments, after muscling a stroller down from street level, past a broken escalator, accompanied by her two young children and their grandmother. They mentioned Westfield Southcenter Mall, which maintains a family lounge next to its food court, providing a diaper-changing table, large restrooms, a sofa and television screens with children’s shows. “Our biggest thing was just making it clean, and then just having directions, a sign for where you’re exiting — this way to the market, that way to the monorail,” she said. Chintan Pathak, a sustainable transportation researcher, suggests a touch screen with voice response, to help navigate downtown and transit lines. “Some advertisements would be good, some offers with Macy’s,” he added. Or maybe lockboxes where people can pick up delivered goods, along with bag-storage space for visitors while they roam. Every minute or two, some lost traveler pivoted to the opposite direction or stared at ticket machines, which inspired another idea for the empty space. Open a customer-service center.